The factory bounded by Norfolk Street and Richardson Street in Carlisle and variously known as Kangol Magnet, ASE, Marmon, BSRD and latterly Breed and Key Safety has been, along with my family, a centre-stone of my life since I first set foot in the place as an interviewee in May 1971. In fact even now in 2017 as I’m putting the finishing touches to the book that I first mooted three years ago, I cannot drive along Norfolk Street without getting a lump in my throat. I look at the modern-build housing and student village that now stands in its place and can only see the car-park, offices and despatch buildings that for so many years formed the frontage of this magnificent business, a business that through to the start of its demise in the mid-1990s was not only one of North Cumbria’s major employers with up to 1000 employees in and around Carlisle, it was the largest seatbelt and in-car safety company in the UK. With annual sales of around £50 million in the late 1980s and early 1990s and with up to 40% of that total being exported its contribution to the North Cumbrian economy and career prospects for so many was vast. Today there is a student village on the site between Norfolk Street and Richardson Street in Denton Holme. Once the site was the life blood of the area. Over a thousand people were employed there. It was the largest seat belt and in-car safety company in the United Kingdom. It sold over £50 million worth of goods every year, and of that considerable production over forty per cent was exported. At various times it was known as Kangol Magnet, ASE, BSRD, Breed and Key Safety. The story of the business began with a Jewish refugee from Poland, Henryk Spreiregen who after living in France, eventually settled in England in 1918. He imported and sold berets. The business was successful and he looked for a brand name to market his product which was made from Knitted Angora Wool. With the K from the first word, the A, N and G from the second and the O and L from the third he had KANGOL and the brand was born. He opened a factory in Cleator Moor. General Montgomery made the beret fashionable and the business grew, opening factories in Frizington and then Denton Holme. The Carlisle factory had been that of William Carrick, who made bowlers and top hats. The equipment needed to form bowlers led the business to venture into making crash helmets for motor-cyclists. By the early sixties they were making several hundred helmets a week. This led to the company turning to other road safety devices. In 1962, Kangol patented a magnetic closure for a safety belt and, with further developments under their “brilliant engineer and designer”, John Kell, the company had a winning product and patents which they were able to license worldwide. Hazel Warwick, who joined the company in 1965, remembers the “cow-tongue” buckle. When Harry Smith started as wages assistant in 1962, the firm was producing 2000 belts a week. Brian Irwin, who still lives in Richardson Street, recalls how “The seat-belt volume dramatically increased over the next few years as Transport Minister Barbara Castle’s new compulsory fitment of seatbelts legislation of 1967 and 1968 started to take effect. He also remembers some “merry japes” the lads used to play on the girls in the factory. Alan Tucker, himself, left his home in Lancashire and joined the firm as Production Manager in 1971. In those days Green Shield Stamps were given as an incentive to production lines which hit their targets. During the three day week in 1972, Kangol was “put on the selling block” and run by consultants. They were taken over by an American business known as ASE and a new manager, John Ogg, was appointed. 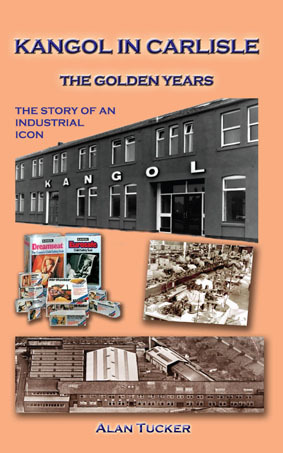 During the following years Kangol followed the ups and downs in the British motor industry. It changed hands from time to time until, in 2003, the American owner re-located production in Roumania. “It was the slow and painful death of a once proud and major employer”. Alan Tucker, after seeing the factory through till its final demise can’t drive along Norfolk Street without getting a lump in his throat. Like many others, he gave his working life to the business. He has interviewed many of his old colleagues and together their memories give an all-round picture of what life was like in one of Carlisle’s most successful factories.